There’s an excited buzz in the room as the Radio and Audio Funding Award (RAFA) pitches are about to begin at the China Exchange in central London, as part of the 2018 edition of the Open City Documentary Festival. The finalists pitching their non-fiction audio projects have the chance to win £7000, a crucial opportunity to secure the funding they need to make their projects a reality. After all, the Radio and Audio Funding Award is the only annual, global and free-to-enter non-fiction audio award of its kind. Finalists have travelled from Chicago, New Delhi, Toronto and Yorkshire to pitch about diverse topics, demonstrating that there are many different kinds of contemporary and engaging stories that deserve to be shared. This year’s judges are Senior Commissioning Editor at the BBC World Service Steve Titherington; TV executive and Consultant Editor for The Whickers, Jane Mote; and independent audio producer and editor Sarah Geis. 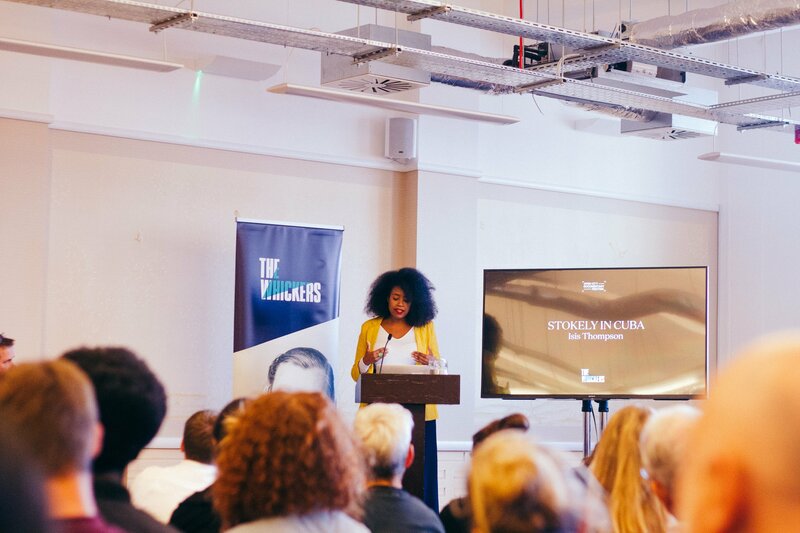 First to the lectern is Isis Thompson and her project ‘Stokely in Cuba’, in which she aims to explore her connection to her cousin, civil rights activist Stokely Carmichael, and in turn learn how to become a better activist herself. In her own words, she wants to provide a guide for “those of us who need a little help going from being clued-up and woke, to being up and out of bed and actually useful”. Using archival clips of Carmichael to guide her journey, Isis aims to stir herself and others into action – at a time when the world is need of activists with a clear purpose. The next pitch of the day belongs to Alex Bulmer and Polly Thomas and their audio feature, ‘May I Take Your Arm?’. Alex, who has been blind since her mid-twenties, is frequently forced to ask for the arm of a stranger when it’s no longer safe for her to walk unaided, whether crossing a busy road or on hearing an unexpected noise. With this act she places her trust in a total stranger, an experience she describes as “from strangers to allies in less than a minute”. Polly explains that the programme will explore how Alex uses sound, and the arms of strangers, to help her navigate her home city of Toronto. The pitching team will aim to put the listener inside Alex’s head as she goes through a mental rolodex on hearing an overwhelming or unexplained noise without shape or definition. Next up is a pitch by the team behind the ‘Biker Radio Rodcast’, a show based in New Delhi and co-presented by Shirshendu Banerjee and Arvinder Singh. Although neither of the presenters ride motorbikes themselves, they are keen to celebrate the rich world of motorcycling in India. With their eventual feature, they hope to explore the identity of motercylicsts who are undergoing a 3000km ride across the Himalayas, capturing “an epic battle between human, machine and mountain”. The fourth slot of the day belongs to Maeve McClenaghan and her project ‘The Refuge Woman’, a story about her friendship with comedian and domestic violence surviver, Cash Carraway. Maeve initially met Cash after the roof of the refuge she was living at in Kensington literally fell in. Since then, Cash has decided publicly speak about her experiences through writing and touring a one-woman-show. In the forthcoming feature, Cash will share her first-hand account of living in multiples refuges, at a time when they have been hit hard by government funding cuts. The final project of the day, ‘Marjorie’, is presented by Chicago-based audio producer John Fecile, who has been speaking to a 78-year-old grandmother from Maine over the phone for months. The eponymous Marjorie is part of the 53% of white women in the US who voted for Trump in 2016 and who initially tells John that she doesn’t believe women should hold political office. However, a recognition of her own experience of sexual assault as a teenager – stirred up by the #MeToo movement – causes Marjorie to reconsider her support of the current US president. – Sam Stone. Sam is a reporter and aspiring film-maker based in Bristol and London. The Whickers Radio & Audio Funding Award Pitch 2018 from The Whickers on Vimeo.